The sprawling, impeccably manicured grounds include thirty different neighborhoods, which are connected by more than five miles of trails and a pedestrian tunnel under Highway 98. If you are feeling lazy, rent a golf cart or hop on a tram. Accommodations are divided into four general districts, each with unique advantages. The village area offers proximity to the marina, tennis center, and the Village of Baytowne Wharf, a retail and entertainment district. Lakeside cottages are quieter, roomier, and set among peaceful pocket lakes. Bayside options offer water views and nearby golf. Beachside condos are mostly high-rises. 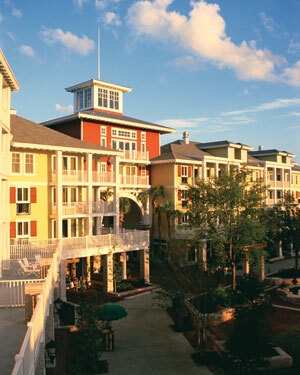 Reserve through Sandestin Golf and Beach Resort (866-91-BEACH, sandestin.com), or rent directly from an owner online. For conventional hotels, Marriott has two properties near the highway, and the Hilton Sandestin Beach Golf Resort & Spa (877-705-6641, sandestinbeachhilton.com) is next door on the Gulf. The 2,400-acre resort provides that elusive key to family harmony: opportunities for everyone to enjoy his or her own pursuits. Tennis Magazine ranks the fifteen-court tennis complex among the nation’s top fifty. The four golf courses include the challenging Raven and Burnt Pine golf clubs, designed by Robert Trent Jones Jr. and Rees Jones, respectively. It’s the only place in the world where courses by the two brothers meet. Water activities range from kayaking, sailing, and YOLO boarding (stand-up paddleboarding) in the marina to fishing in the ubiquitous lakes and ponds. The Hilton’s spa, Serenity by the Sea, is more luxurious than Sandestin’s and just as convenient. Baytowne Wharf offers fun boutiques—Lilly Pulitzer and Nanette Lepore in the same store!—and play areas starring a zipline across a lagoon. For true power shopping, hit nearby Silver Sands Factory Stores, the nation’s largest designer outlet center. Baytowne Wharf is packed with themed eateries—from Acme Oyster House and Jim ’N Nick’s Bar-B-Q to Osaka Sushi Rocks. Though the target demo skews young (did we mention Fat Tuesday Daiquiri Bar? ), the restaurants and bars are surprisingly good. Highlights include Marlin Grill (850-351-1990), a steak-and-seafood house with an award-winning wine list and terrace view of the village center, and Bistro Bijoux (850-622-0760), a New Orleans–flavored cafe. Hit Another Broken Egg Cafe (850-622-2050) at least once for breakfast. Overlooking the Gulf is Finz, a fine-dining spot with a spicy, citrus-accented menu—plus happy hour martinis and tapas. The Hilton’s Seagar’s Prime Steaks & Seafood offers a clubby respite. And of course, Sandestin is close to restaurants along 30-A. Grab your flip-flops and head to newly expanded local favorite Stinky’s Fish Camp (850-267-3053) in Santa Rosa Beach. Sandestin offers amenities and activities for every member of the family. TIP: Renting directly from the resort may be worth the extra expense, as the amenity card provides, among other things, access to a seasonal day camp and kids’ nights out.